Through LINC-UP Missions, “Project Living Water” is providing clean drinking water to a forgotten South American people group. These people live in remote jungle communities. Many of them are sick for a lack of clean water, but all of them are dying without the Living Water — Jesus Christ. These earthen water filters serve a great humanitarian need but also serve as the key to open these otherwise closed villages to the Gospel message. Prior to the arrival of the Gospel, these villagers were consumed with fear that is spread through a belief system which includes the worship of dead ancestors, idolatry and witchcraft. These communities are kept in the power of darkness through the practice of local witch doctors, who unashamedly call upon the spirits to cast spells and perform “miraculous signs.” This, in turn, keeps the villagers subjected to their power and therefore confined to a life without hope. The goal of LINC-UP Missions is to provide one filter for each household in nearly 700 villages. Each village has an average of 70 households. Each water filter costs $15. The cost to supply clean drinking water for an entire village is $900. 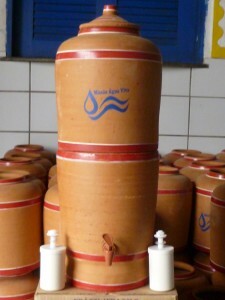 However, the eternal impact of these water filters is immeasurable. Through Project Living Water, many are coming to faith in Jesus Christ. They are experiencing the supernatural peace of abundant and eternal life.